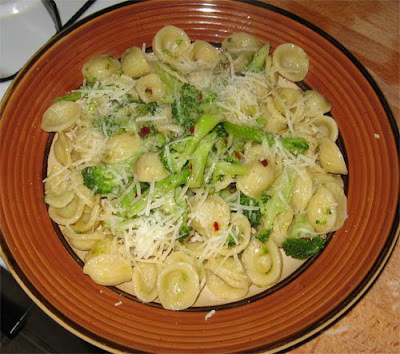 A southern Italian (Apulian) classic: "little ear" pasta with a sauce of anchovy, olive oil, chili, and broccoli. Topped with pecorino sardo. Fantastic flavor, next time I think I'll add some broccoli rabe for some added complexity. I love the mustardy flavor of rabe, it goes well with the chili and the anchovy.